software sampler to import CD-ROM based sample libraries in the Akai format. This new version also features the DeConvolution tool for the Space Designer realtime convolution reverb, for those using Panther. Another feature of version 6.3.2 is that Delay Compensation can now be manually adjusted in Panther. Logic 6.3.2 fixes a problem when using EXS24 with enabled Virtual Sample Memory on Dual G5 Powermacs. Logic always compensated the Core Audio driver latency so that recorded audio appeared at exactly the intended position in the Arrange window. Unfortunately, some drivers are reporting a wrong latency value causing Logic to fail in this task. In these cases you can now set a manual value for driver latency compensation in Preferences > Audio Drivers. If you are using the built-in audio hardware, it is not necessary to change the Recording Delay default value 0. Also when using Mac OS X 10.3 (Panther) it is now possible to import Akai CD ROMs into EXS24 and to use the Deconvolution function of the Space Designer. Other Improvements -Recording is now possible on track numbers 128 or higher. -I/O Labels given by the driver are now visible in Logic (requires Mac OS X 10.2.8 orhigher). -When loading multiple samples into the EXS24 chromatically, they will be sorted again by file names. If you are using a Pro Tools HD system with the new HD Accel card from Digidesign, please upgrade to Logic Platinum version 6.3.1 or higher. This is required to take full advantage of the increased number of audio tracks with a HD Accel card. The zoom-dependent drag grid (Smart Snap x introduced in version 6) is now available as an option. Use the option ÒSmart Snap when draggingÓ on the Global Preferences page (Logic menu > Preferences > Global Preferences). If this option is switched off, Logic acts like before version 6: You can move objects quantized to bars, with CTRL pressed down quantized to the Format value, with CTRL and SHIFT you can move objects in Ticks. In older 6.x versions, hanging MIDI notes were possible in certain situations. Logic Platinum users of TDM systems under Mac OS X you could get the DAE error message x9060 when record enabling tracks in Punch on the flyÓ mode. These problems are fixed. Version 6.3 or higher is required to run the Space Designer, Emagic's new premium reverb, which is based on convolution technology. Space Designer is available as a separate product. However, you can test Space Designer within the usual four week demo period, starting with the first use. You can find Space Designer in the Reverb section of the plug-in menu. The Logic 6.3 Updater/Installer installs the Space Designer demo presets (including impulse response files) on your hard drive. The real-time convolution process utilized by Space Designer is CPU intensive. Should you encounter audio artifacts while using Space Designer try increasing your I/O Buffer size: Audio -> Audio Hardware & DriversÉ'-> I/O Buffer Size. You may also try to reduce the CPU power used by the Space Designer (see below). The CPU power needed by the Space Designer increases with the reverb length. We recommend removing silence at the end of an impulse response (IR) recording. In many cases it is also possible to shorten inaudible tails in the decay phase of IR files. Note: The Space Designer Sound Library is already optimized in respect to IR length. A large amount of CPU power is gained by reducing the sample rate in Space Designer. You may find that for many reverb sounds, a rate of 1/2 of the original sample rate is adequate, thus reducing the CPU load by approximately 50%. To retain the original reverb length, activate the function preserve length . For technical reasons the Space Designer IR files are currently not tracked by Logic's Project Manager. For this reason IR files are not copied/moved when using the Logic function Save as ProjectÕ. Please copy used IR files manually to your project folder, if required. We apologize for this inconvenience. There are now separate settings for Bend Range up and down with an optional "link" mode. Via invert ( inv ) inverses the effect of the Via modulation source. As in other plug-ins, you can select a sidechain source (tracks, inputs, busses) in the upper gray area of the window. This source is fed to the internal envelope follower, which creates a modulation value according to the current signal level. It is available as modulation source/via source in every router (ÒSideChÓ). Attack and Release times of Envelope 2 and 3 (Env2/3 Atck/Rel). Lfo1Asym changes the waveform of LFO1: in case of a rectangular wave it changes its pulse width, in case of a triangular wave it changes between triangle and sawtooth, in case of a sawtooth wave it shifts its zero crossing. Lfo1Curve allows you to modulate the smoothing of rectangular and random waves, in case of triangular or sawtooth waves, it changes their curves between convex, linear and concave. The new parameter "Curve" sets the shape of the transition from point to point (which was always linear in older versions). Now you can additionally choose different convex/concave shapes, including their extremes hold+step and step+hold which allow stepped modulation (jumping either at the start or end of the transition time). Especially hold+step is great for stepped vector grooves with up to 15 steps. The interface for the Vienna Symphonic Library x Performance Set is now also availabe in Logic Platinum for OS X..
With a simultaneous release date, Emagic offers the first Logic version optimized for the world's first 64 Bit personal computer, the Apple Power Mac G5. The update to Logic Platinum 6.2 is available on the same day as the G5 itself. This new Logic Platinum version is available in the form of the Version 6.2 update, and is a requirement when running Logic on the G5. All registered owners of Logic Platinum 6.x can find this as a free download. Musicians will experience increase in both speed and performance when using the combination of Logic Platinum 6.2 and the G5. 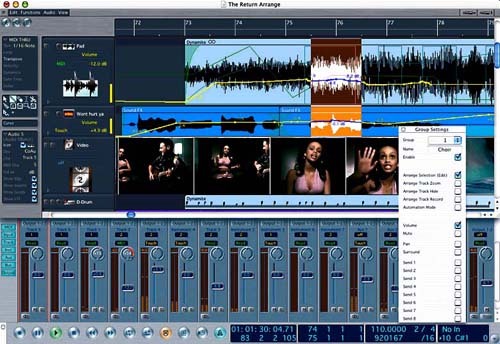 The ability to work on noticeably larger projects , including more software instruments, audio tracks and effects plug-ins, expresses more clearly than ever both the expanding potential of native music and audio production, as well as Emagic's and Apple's ongoing commitment to the professional creative community. "The G5 is a dream machine for musicians," says Dr Gerhard Lengeling, Emagic co-founder and Chief Architect Audio Applications. "The introduction of the first 64 Bit desktop processor means a huge step towards an integrated computer-based native music production system. One that includes software instruments, composing and post-production tools. As a musician you will experience an incredible performance boost. Not only CPU-hungry plug-ins, obviously, but also those functions which require moving lots of audio data in RAM benefit greatly from the extremely fast new bus architecture." Many aspects of audio applications will profit from the new G5 Frontside Bus; for example, especially when large amounts of audio data must be streamed, or moved in memory. This includes audio inputs and outputs plus audio busses within an application's internal mixer. In addition, Emagic's EXS24 software sampler and all effects plug-ins, such as Emagic's PlatinumVerb, will benefit markedly from the new bus architecture. Logic Platinum 6.2 also includes special performance optimizations for Power Mac G5 models with dual processors. To run this version, Mac OS X 10.2 or higher and an existing XSKey authorisation for Logic Platinum 6 Mac is required. XSKey owners, for example, current Logic 5 users, can try out Logic Platinum 6 for maximum 28 days, as long as the Platinum demo period on the XSKey has not expired. To continue use of Logic Platinum 6 without any time limit, you have to consult your local Emagic distributor for purchasing information regarding the Logic Platinum 6 Update. Logic Platinum 6 for Mac OS X now offesr ( free-of-charge for owners of Logic Platinum 6 @ emagic) support for Digidesign TDM systems , allowing Logic users with TDM systems to make the transition to Mac OS X. The Arrange window of Logic 6 now features a new "Freeze" button on all audio and audio instrument tracks. The basic concept behind this feature is to maximize the CPU resources available to Logic. "Freezing" CPU-demanding tracks, such as tracks using complex software instruments and effect plug-ins, reduces their CPU-load down to the minimal demand of an unprocessed stereo audio track thus freeing-up potentially very large amounts of CPU-power which can be used for other purposes. This also allows the playback of Logic songs created on faster machines which would normally overload a slower machine's CPU processing capabilities. All users will benefit from this feature, regardless of the computer being used ; more plug-ins, more audio instruments and more tracks can be used simultaneously. Tracks can be unfreezed at any time for further editing. Another feature in Logic 6 is the Offline Bounce. This feature allows users to bounce faster than real-time or to bounce songs that would otherwise cause system overloads. Each channel in Logic can now be assigned to one of 32 groups. Each group can be a mix group, an edit group, or both. Channels can be assigned to multiple groups. Naturally, this feature improves Logic's fundamental automation engine while at the same time accelerates workflow and affords users improved live editing possibilities. Such as, improved vocal editing, assigning level meters to a group, or muting drum sets. The new Video Thumbnail track displays a film as single frames, aligned horizontally in the Arrange Window. The number of thumbnails displayed is dependent on the current zoom level. In order to view the QuickTime video on a standard TV or video monitor, Version 6.0 now allows the output of a DV-formatted QuickTime movie via FireWire. This allows the connection of a standard DV camera or FireWire conversion box to Logic. Users can now directly activate the new Project Manager from the Arrange window. The Project Manager consolidates all media files on local volumes by recognizing the dependencies between audio files, sampler instruments, settings and movies. The Project Manager is extremely flexible: users can rename files, add or edit comments and change references to one, or multiple song files. All media files can be saved in a new "project" file format, making archiving and transport of projects created in Logic easy. The Setup Assistant is a tool that guides users step-by-step (..... even the extreme novice) through the process of setting up and configuring Logic. In a simple and interactive Q & A session users learn how to easily create preferences, configure key settings and create their first template song in Logic. With Logic 6 a new Arrange Tool is introduced: the Marquee Tool. The Marquee Tool allows region and sequence independent selection and editing: move, copy, delete, cut, mute, etc. Time Stretching directly in the Arrange window is now possible with Logic 6: the length of an audio file or a loop can now be quickly adapted to the chosen bar. Improved Overview and Track management is now possible in the Arrange window with "Hide Track". Hide Track does not affect playback. Logic 6 features new and user-definable Arrange window Icons. Logic 6 features the intuitive new Channel EQ Plug-In. It features 8 bands with fixed modes: a highpass filter, a low shelving EQ, four parametric EQ bands, a high shelving EQ and a lowpass filter. All bands are fully parametric. Each channel EQ has an optional "high resolution analyzer" graphic display mode. ReWire 2 slave applications, running alongside Logic Platinum 6 on the same computer, can now be synchronized via ReWire 2. In addition, Logic MIDI sequencer data can control the virtual synthesizers and samplers of ReWire 2 software (e.g. Reason). Up to 64 high-resolution audio channels can be routed from Rewire 2 slaves, with sample-accurate precision, via Logic's mixer. Logic 6 can now be controlled by the following third-party hardware controller units: Motormix by CM Automation, SAC-2k and SAC 2.2 by RadikalTechnologies, Tascam US-224 and US-428, HUI and Baby HUI by Mackie, DM2000 and 02R96 by Yamaha. These hardware controllers can be used in combination with each other , or as part of an expandable Logic Control and Logic Control XT system. In this manner customers can build hardware control systems precisely tailored to their needs. This offers unmatched Control Surface flexibility. The newly integrated One Fader Automation facility allows the selected automation parameter to be controlled by any controller , e.g. a Mod Wheel..
La finestra Arrangiamenti di Logic 6 contiene il nuovo pulsante "Freeze" per tutte le tracce audio e dedicate a strumenti audio. La filosofia sottesa alla funzione è quella di aumentare al massimo le risorse della CPU disponibili per Logic. Il "congelamento" di tracce che utilizzano una quantità elevate di risorse della CPU, ad esempio delle tracce che utilizzano strumenti software e plugin complessi, reduce il carico della CPU al minimo necessario per una traccia audio stereo non elaborate e libera quantità potenzialmente molto rilevanti di potenza di elaborazione della CPU che possono essere utilizzate per altri scopi. Ciò consente inoltre la riproduzione delle song di Logic create su macchine più veloci che normalmente sovraccaricherebbero le capacità di elaborazione di una macchina con CPU più lenta. Tutti gli utenti trarranno vantaggio da questa funzione, a prescindere dal computer utilizzato: sarà infatti possibile avvalersi di più plugin, più strumenti audio e più tracce simultaneamente. Le tracce possono essere "scongelate" e modificate in qualsiasi momento. Un'altra interessante funzione di Logic 6 è il bouncing offline. Ciò consente un bouncing più veloce rispetto al tempo reale o il bouncing di song che altrimenti causerebbero sovraccarichi al sistema. Ciascuno dei canali di Logic può ora essere assegnato a uno di 32 gruppi. Ciascuno dei gruppi può essere un gruppo di mix, un gruppo di edit o ambedue le cose. I canali possono essere assegnati a più gruppi. Naturalmente questa funzione migliora le prestazioni del motore di automazione di base di Logic, accelera il flusso del lavoro e mette a disposizione degli utenti ulteriori possibilità di modifica dal vivo. Ad esempio sono possibili una più efficiente modifica delle parti vocali, l'assegnazione di indicatori di livello a un gruppo o la messa in "mute" dei drum set. La nuova strip di canale nella finestra Arrangiamenti consente di apportare modifiche al mix durante il lavoro nella finestra stessa. Se si seleziona una traccia nella finestra Arrangiamenti, il sistema visualizza il canale del mixer corrispondente nella sezione dedicate ai parametri della finestra Arrangiamenti stessa. Questa nuova funzione reduce la necessità di passare alternativamente dalla finestra Arrangiamenti alla finestra del Mixer delle tracce di Logic. La nuova traccia Video Thumbnail visualizza un filmato sotto forma di singolifotogrammi, allineati orizzontalmente nella finestra Arrangiamenti. Il numero dei fotogrammi visualizzati dipende dall'ingrandimento utilizzato. Per visualizzare un filmato QuickTime su una normale TV o su un monitor video, la versione 6.0 di Logic consente l'uscita di un filmato QuickTime in formato DV tramite porta FireWire. Ciò consente la connessione a Logic di una normale telecamera DV o di una "conversion box" FireWire. Gli utenti sono ora in grado di attivare il nuovo Project Manager direttamentedalla finestra Arrangiamenti. Il Project manager consolida tutti i file multimediali su unitàlocali riconoscendo le interdipendenze tra file audio, campionatori, impostazioni e filmati. Il Project Manager è estremamente flessibile: gli utenti sono in grado di rinominare i file,aggiungere o modificare commenti e modificare i riferimenti a uno o più file di song. Tutti i file multimediali possono essere salvati in un nuovo formato file "project", che rende facile ed efficiente l'archiviazione e il trasporto di progetti creati in Logic. Ampiefunzioni di ricerca aumentano l'utilità di questo strumento. Il Setup Assistant (solo OS X): i primi passi con Logic. Il Setup Assistant è uno strumento unico nel suo genere che guida gli utenti, anche i meno esperti, a passo a passo attraverso tutto il processo di impostazione econfigurazione di Logic. In una semplice e interattiva sessione a domande e risposte gli utenti imparano come creare con facilità le proprie preferenze, configurazione impostazioni chiave e creare laprima song modello per Logic. Logic 6 presenta un nuovo tool della finestra Arrangiamenti: il tool Marquee (Selezione libera). Il tool Marquee consente la selezione e modifica (ad esempio spostamento, copia, eliminazione, taglio, messa in mute e via dicendo) indipendenti da regioni e sequenze. Logic 6 consente il Time Stretching direttamente nella finestra Arrangiamenti: la duratadi un file audio o di un loop può così essere facilmente adattata alla battuta selezionata. Nella finestra Arrangiamenti è ora possibile una gestione migliorata della panoramica e delle tracce grazie alla funzione "Hide Track". La funzione Hide Track non influisce sulla riproduzione. Logic 6 mette a disposizione icone nuove e personalizzate nella finestra Arrangiamenti. forma d'onda di una regione audio sino al livello della risoluzione di campionamento. Logic 6 mette a disposizione il nuovo e intuitivo plugin Channel EQ. Il plugin dispone di 8 bande con modalità fissa: un filtro passa alto, un EQ passa banda grave,un equalizzatore parametrico a quattro bande, un EQ passa banda acuta e un filtro passa basso. Tutte le bande sono completamente parametriche. Per ciascuno dei canali è disponibile una modalità di visualizzazione opzionale "high resolution analyzer". Oora possibile sincronizzare tramite ReWire 2 applicazioni slave ReWire 2 eseguite insieme a Logic Platinum 6 sullo stesso computer. Inoltre è possibile controllare i sintetizzatori e campionatori virtuali del software ReWire 2 (ad esempio di Reason) mediante i dati del sequencer MIDI di Logic. Il mixer di Logic consente l'istradamento, con precisione al singolo campione, di un massimo di 64 canali audio ad elevata risoluzione provenienti da applicazioni slave Rewire 2. Logic 6 può essere controllato mediante i dispositivi hardware di altri produttori : Motormix di CM Automation, SAC-2k e SAC 2.2 di RadikalTechnologies, HUI e Baby HUI di Mackie, DM2000 e 02R96 di Yamaha. Tali comandi hardware possono essere utilizzati liberamente in combinazione gli uni con gli altri o come parte di un sistema espandibile Logic Control e Logic Control XT: in questo modo è possibile realizzare sistemi di controllo hardware perfettamente adeguati alle proprie esigenze. Rapido accesso ai parametri di automazione . La nuova automazione a singolo fader consente il commando del parametro di automazione selezionato mediante qualsiasi dispositivo di controllo, ad esempio una ruota di modulazione.